When I first wrote about Hopton church, I was a little patronising, perhaps. 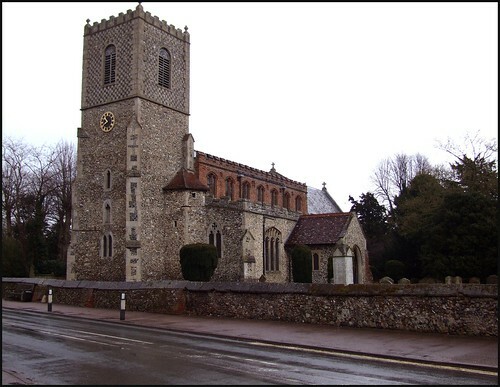 The charms of most Suffolk churches are an open book to all but the most casual visitors, I noted, but some churches are more complex, demanding time and a certain amount of experience to decode. I hope that I would not write such nonsense now. Certainly, there is plenty to explore at Hopton. But to step inside here is to know that it is, at the very least, merely beautiful, and probably much more besides. In fact, there is work here from every century from the Twelth to the Twentieth, but it does not take an architectural historian to enjoy the experience of exploring it. All medieval churches, after all, are complex, with layers of meaning to be unlocked. If nothing else, it is enough just to stand and say oh, isn't it lovely! And All Saints is lovely, and apparently little-known. I first visited it in the late summer of 1999. I was cycling from Thetford, through the north Suffolk borderlands, and enjoying every minute of it. At some point, I would have to think about turning south, if I was to make it back to Ipswich in time for tea. But I deferred this as long as possible, like a child using stories to stay awake: "Just one more church, oh go on, just one more church, and then I'll head south - pleeeese?". The last 'just one more' church was Hopton, and I was glad that I gave in to myself. The north Suffolk villages are surprisingly large and self-contained, compared to their soft southern cousins. All Saints stands opposite the village shop. You can sense, in a village like this, that the church has a place at the heart of its community, and I was glad to find it open. The exterior is elegant and integrated; the south aisle is a 14th century replacement of a 13th century one, features of which still survive. Beyond and above it, one of the most handsome late 15th century brick clerestories in Suffolk rises to nestle beneath the 18th century top of a 14th century tower. My only slight disappointment was that the little H-shaped chimney above the east end of the nave, which I had seen in a photograph taken thirty years before, had been removed. Coming back in 2008, nothing had changed, except the weather. The rain was turning to stair rods as we walked briskly up the path, but the handle turned and I pushed the door into the deep and hushed interior. The first impression is of one of those relatively triumphalist High Church interiors of the early 20th century, but in fact work of all ages survives. The best was above out heads, one of the most charming 15th century roofs in north Suffolk. There is a button under the tower which you can use to temporarily illuminate it. The figures on the hammerbeams appear naive, as if they might not have been intended as angels at all. They look as if enthusiastic locals carved them, and gave them each others faces. They carry symbols of the Catholic liturgy; chalices, patens, missals, etc. The fading colour on them is not medieval, however. It was put on in the late 19th century by the five daughters of the Rector, a lovely personal response to the call of the Oxford Movement and the ascent of Anglo-catholicism. It was almost certainly inspired by the remarkable work of Mildred Holland at Huntingfield. There is something wholly human about both carving and painting, despite the 400 years and the Reformation that divide them. The rood stair curves up from within the north arcade. There are stumps of wood cut flush with the inside of the chancel arch; various guides describe these as the ends of the rood beam, but they are clearly too low. They are level with the foot of the upper rood loft stair opening, and so are probably something rarer; the ends of the beam supporting the roodloft floor. The 12th century chancel has, unusually, two low side windows in the south side.Why was this? Even more of a puzzle is the glass in the east window, which Mortlock says is by TF Curtiss for Ward & Hughes. It depicts Christ in Majesty surrounded by the Company of Saints, while below is a Crucifixion scene. What makes it a little unusual is that many of the figures have been given what appear to be the faces real people. The Blessed Virgin and St John, flanking the cross, are the most obvious, but there are also late Victorian ladies taking the guise of St Catherine, St Agnes, St Cecilia and St Barbara. Could they be the daughters of the couple in the Crucifixion? St Stephen may also be based on a real person, although he looks like nothing so much as John Henry Newman. Probably the better window is in the east end of the south aisle, a typically rich Annunciation scene by Kempe & Co. If Mary looks a little older than she should, she is certainly very beautiful. The memorial in the chancel is signed by Thomas Fellows of Kings Lynn, the skull at the bottom is restrained, and yet rather eerie - its eyes, or more exactly its sockets, seem to focus on something beyond the present. 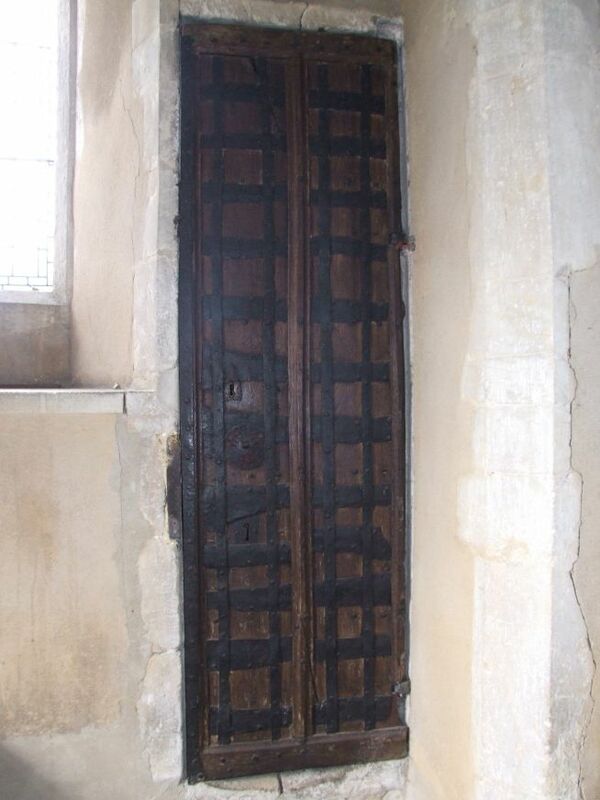 At the other end of the nave, there is a medieval door to the tower stairs, fortified with iron like the one at Gosbeck. Impressive stuff. Back in 1999 I had headed south at last, and headed back to Ipswich through Hinderclay, Botesdale, Rickinghall Inferior and Rickinghall Superior, thinking them such lovely names. In 2008, we came out to warm spring sunshine which would not let up all day, and headed on to the open fields of Market Weston.